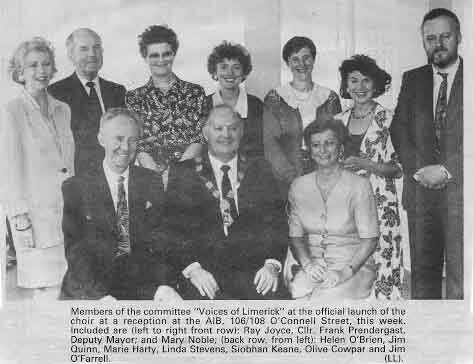 “Voices of Limerick” is a mixed-voice SATB Choir and was formed in 1992. The Name was chosen by vote of the members and they agreed it evoked memories of the great choral tradition for which Limerick was greatly admired. The choir determined that from the outset it would concentrate on the great Grand Opera choruses, it also included in its repertoire choruses from Gilbert & Sullivan, Lehar and others. “The Voices” enjoy singing many of the great choral arrangements and has on occasion performed works that have been specially commissioned for the choir . “Voices of Limerick” made a very happy decision to invite Colette Davis (nee Cantillon) to act as its Musical Director. Colette, as well as being a gifted pianist and accompanist, had acted as Chorus Mistress to the Limerick Choral & Operatic Society for many of its productions. In the twenty or so years since its formation it has been a great success and has received the highest critical acclaim. The choir was privileged to perform with many of our own leading Singers such as Frank Patterson, Cara O’Sullivan, Majella Cullagh, Virginia Kerr and Regina Nathan. The choir has also performed with the Concert Orchestra and the New Jersey Symphony Orchestra. 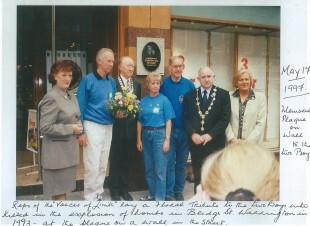 Colette Davis and “Voices of Limerick” were the driving force, in association with the Irish Peace Institute, in setting up memorable concerts in St. Mary’s Cathedral and Glenstal Abbey, Limerick, during the visit to Ireland of The Warrington Male Voice Choir in August 1996. 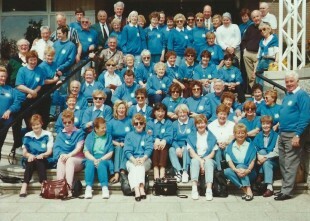 In May 1997 “Voices” reciprocated by travelling to Warrington to sing in a concert in Parr Hall with the Warrington Male Voice Choir with Fiona Clucas (Soprano). After experiencing a series of different rehearsal centres such as John F. Kennedy National School, which was the choir’s first rehearsal venue, and St. Clement Hall at the Redemptorist Monastery for many years, the choir has settled in its present home at Mary Immaculate Training College. We are fortunate enough to have many of the founding members still singing with us after all these years. These original “Voices” have been joined by many newer members and we are happy to have maintained our membership at about 70 active paid up members at any time. As well as the many invitations that we receive to sing, we also put on our own gala concert every two years. These have traditionally taken place in UL Concert Hall and are wonderful evenings of choral music, solo songs and arias sung by well-known opera stars and piano recitals by our good friend Phillip Thomas. For an amateur choir to stage our own concert is a major commitment, both in terms of learning new repertoire and also ensuring that we have sufficient resources to cover the expenses involved. Lack of funding is the main reason why we don’t put on an annual concert. At present “Voices of Limerick” rehearse each Monday evening from 8 p.m. – 10 p.m. in a Lecture Hall in Mary Immaculate College. New members are always welcome and are received warmly by the other members.